The Buffalo Bill Center of the West’s hours change for the autumn season September 16. Mark your calendars for all the great fall activities the Center has to offer for the whole family. Mark your calendars; fall is about to begin. From Patrons Ball and Rendezvous Royale to Family Fun Days, there is never a dull moment at the Buffalo Bill Center of the West. The Center moves to its fall hours September 16 when it opens 8 a.m.–5 p.m. every day through October 31. The Draper Museum Raptor Experience changes its presentation times on September 16, inviting visitors to “Relax with Raptors” at 1 p.m. daily. Don’t miss this informal time to see and learn more about the eleven live raptors housed at the Center. For Park County students, the Center offers a Teen Room featuring a foosball table and a comfortable hangout/study area. Admission is free to access the Teen Room. A young “Buzz Lightyear” carefully considers his favorite in the pumpkin-carving contest at a Hootin’ Howlin’ Halloween Family Fun Day. On October 26, the Center hosts its 8th Annual Hootin’ Howlin’ Halloween. 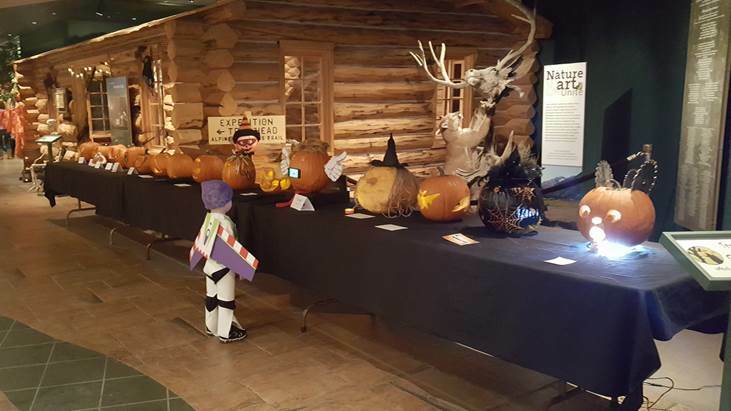 Families are invited to enjoy fun activities, trick-or-treat, judge Center staffers’ entries in the annual pumpkin-carving contest, and see our raptors. Costumes are, of course, encouraged but not required. This Family Fun Day is made possible in part through a generous grant from the Harold R. Burton Foundation.